This brief summary has clickable links to photographs and further details. If you would like further details of the 1875-1993 period, we recommend Ivan Barwell's book, which you can read freely from this website. Also recommended are Felix Aprahamian's stirring sleeve notes for the 1970 and 1996 reissue of the legendary EMI recordings, available to read here. 1873 Alexandra Palace was built as North London's answer to the Crystal Palace, which was built in Hyde Park for the 1851 Exhibition, then transferred to Sydenham Hill. Pride of place was given to a grand concert organ by 'Father' Henry Willis, one of the most famous of the Victorian organ builders. Some three weeks after opening, the Alexandra Palace burned to the ground together with the Willis Concert Organ. Father Willis tried vainly to save some portions of the organ, at great risk to his own life. 1875 A new Alexandra Palace was opened, its new Great Hall containing a new Willis Grand Concert Organ, which Father Willis thought to have been his best work. 1907 After various alarms about closure, the Park, Palace and the Organ were saved for the people. 1914-1918 The First World War saw first refugees, then internees housed in the grounds. The organ was extensively vandalised by soldiers celebrating the armistice. 1925-1926 An Organ Restoration Committee was set up. When Queen Alexandra, widow of Edward VII, died, the fund was dedicated to her memory. An article in The Rotunda describing progress towards restoration. 1929-1930 December saw the grand opening of the restored organ, to universal acclaim. It was not long after this that Marcel Dupré ‘the greatest organist of his day’, giving his first recital on the organ, called it ‘The finest Concert Organ in Europe’. Extensive photographs and details of the triumphant restoration. Henry Willis III's detailed article in The Rotunda. The EMI recordings which were to become legend are made by Marcel Dupre, G.D. Cunningham and Reginald Goss-Custard. Even today, they give us the best evidence of the astounding tonal success of the Alexandra Palace Organ. Details and samples of the vintage recordings. 1937-1939 An Appeal was launched in 1937 leading to the pitch being lowered to modern concert pitch, the cost being met by the proceeds from a grand Handel Festival conducted by Sir Henry Wood before an audience of 5,000. Appeal documents and photo of Henry Willis III working on the organ. 1944 A V1 Flying Bomb blew out the Rose Window behind the organ, and although the organ wasn't badly damaged by the blast, it soon was by the weather. Years of neglect followed. 1950 Following WWII damage, the instrument was dismantled for storage at The Palace. Photographs of part of the dismantled instrument, the facade, and the scaffolded hall. 1960 Another Appeal was started up, but died out without getting anywhere. Colour photograph of the silent facade. 1966 The Palace passed to the newly formed Greater London Council. One political party wanted it knocked down, the other party wanted to sell it. It was publicly stated that it was laughable to think that people would still come to the Palace in their thousands and anyway, if they did the floor would fall in. 1969 The Alexandra Palace Arts Society was formed. At its first ‘Messiah’ with the London Philharmonic Orchestra, a choir gathered from all over England and Wales, and with Yehudi Menuhin giving his services as conductor, before a very large audience, proved the GLC wrong on both counts. The concerts were repeated in 1971 and 1973. Once again, thoughts were turned to restoration. The GLC would not allow further work to be carried out and tried to sell the organ. Scan of the advertisement for sale. Henry Willis 4, great-grandson of the original builder, succeeded in buying the organ from the GLC ‘on behalf of the nation’, to prevent further deterioration. He prudently removed some of the pipes to his workshop for safe keeping, but the GLC ruled that the casing and the dominating pipes from the 32 foot pedal diapason had to stay. Photographs of the facade and the concerts. 1970 EMI produced an LP of pre-war performances on the Alexandra Palace organ by great organists of their day. 1980 The Alexandra Palace Arts society raised sufficient funds for a symbolic handover of a cheque for £1,000. Photographs of the handover and the terrible state of the organ in 1980. The Palace was sold by the GLC to Haringey Council for the nominal sum of £1, but almost immediately came the disaster of the fire which destroyed the Great Hall, including what remained of the organ. Photographs of the devastation caused by the fire. A public inquiry after the fire left no doubt that they wanted the Palace rebuilt, they wanted the Great Hall rebuilt and they wanted the organ rebuilt. The problem was money. The Palace, including the Great Hall, were to be rebuilt from the insurance money, but not the organ. At this point the Alexandra Palace Arts Society reformed itself, under the chairmanship of Felix Aprahamian, into the ALEXANDRA PALACE ORGAN APPEAL (APOA). 1983 Restoration work began at the Palace. In the Willis factory in Petersfield, the surviving parts of the Alexandra Palace Organ were restored by the great-grandson of the original builder. Photographs of the Palace and parts of the organ in the Willis factory. 1986 The Great Hall and organ gallery took shape whilst in the Willis factory at Petersfield the fourth incarnation of The Alexandra Palace organ was assembled. 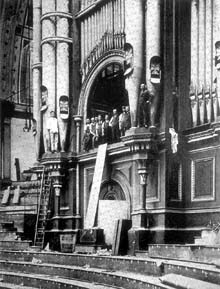 Photographs of the Palace and the reassembled organ in the Willis factory. 1989 The organ is installed on the Gallery. Photographs of the organ in the Great Hall. 1990 The partly rebuilt Alexandra Palace Concert Organ sounded again to its public, thanks to all those who had donated so generously to the Appeal. Those who were there will never forget that moment. The owners of the partially restored organ are now the Palace Trustees, but they still depend upon the Appeal to raise the funds. Details and photographs of the re-opening concert. 1993 Henry Willis 4 wrote about the special problems which the chosen strategy - piecemeal restoration - caused. 1996 Work on the organ continued with a grant from the Foundation for Sport and the Arts of £30,000 towards completing the Choir section. The choir organ was now complete, but several stops were loaned by the organbuilder due to a funding shortfall. A grand dinner was held in the new double-width, double-height Swell box to celebrate its construction. A new humidification system was installed to combat the climatic conditions in the hall. Mirabilis remastered the EMI LP of the pre-war recordings onto CD, EMI generously waiving their copyright so that the Appeal could raise funds towards restoration. Details and samples of the Mirabilis remaster of the vintage recordings. 2004 Following a very successful concert season, the appeal published some sound samples from the live recordings. 2005 Summary of the restoration to date, Specification and Photographs.